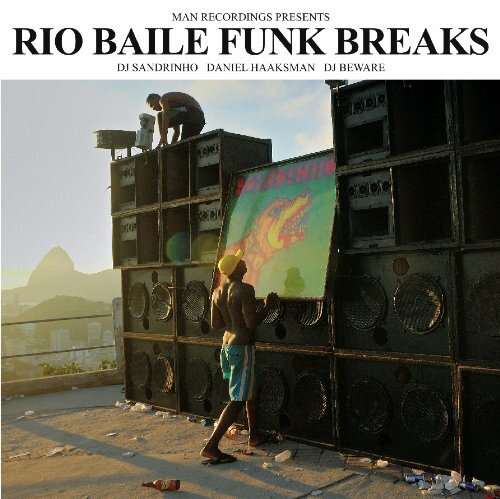 Baile Funk, or more accurately, funk carioca, has been a major influence in the favelas of Brazil for decades, but it has only begun to reach the mainstream music worlds of the United States and Europe in the past few years. The baile funk clubs ("baile funk" literally translates to "funk ball", a reference to the genre's emphasis on an over-the-top, dance-centric experience) may be where this unique style of music began, but it has certainly spread throughout the world. After finally hitting Rio de Janero's mainstream airwaves in the mid-80's, the baile funk phenomenon quicky expanded, growing in musical influence and in turn being grown by new sounds. From the primarily electric sound of Miami Bass, baile funk began to incorporate Brazilian instruments and rap styles. In the mid-90s, baile funk sunk deep into Brazil's ghettos, called the favelas, and the nature of the music changed. "Before, funk was like samba, the slum singing to the rest of the city, telling them about their issues. After, it became the slum singing for the slum." -DJ Marlboro, Godfather of Baile Funk. The new inner focus of the genre could have spelled out stifling disaster— never leaving the slums of Rio. Instead, baile funk DJ's began playing their music internationally, drawing attention from all corners of the world to this rough, gritty music. At first, the growth was slow. International interest was certainly there, but baile funk artists were slow to begin travelling outside of their stomping grounds. Before too long, however, artists like DJ Marlboro were performing in far-flung locales, from Japan to Slovenia and even to France. Today, baile funk has become popular in many countries, with worldwide sales steadily climbing. Popular recording artists are getting in the act: MIA's "Bucky Done Gun" is a pastiche of "Injecao", a baile funk track by DJ Deize. Fatboy Slim remixed a carioca funk track, and Hollertronix remixed Gwen Stefani's "Hollaback Girl" with a DJ Marlboro funk beat (The Observer). Part of this global expansion is pure necessity: In Rio de Janero itself, carioca funk is still very misunderstood and scorned. "DJs in the northern hemisphere have been drawn to baile funk's punk energy and its rough patina of ghetto cool." The influence runs both ways. Baile funk has changed due to its international exposure as well. At the birth of the genre, it was predominantly a Miamian sound. But after a few years spent in the favelas of Brazil, the funk style evolved into something new. As baile funk absorbed into itself the sounds of Rio de Janero— the gunshots, the catcalls, the relentless Portuguese rap style and the traditional drum sounds— it became something culturally separate from the Miami Bass style. "When we substituted the foreign beats with our own groove," says Mr. Castra, "it became something that could only be made here" (Natal). Today, baile funk music continues to influence (and be influenced by) new sounds emerging around the world, from the techno-electric beats of Eastern Europe to the grinding 70s R&B that is finding its way back into the funk's style. As DJ Marlboro and his fellow artists continue to spread the sound of baile funk around the world, the music continues to evolve. Says Marlboro, "Funk is finally being perceived as the cultural movement that it is, and one of the reasons is that the style is reaching its maturity. We are seeing the boom of a genre now" (Natal). "Ghetto Fabulous | Music | The Observer." Latest News, Comment and Reviews from the Guardian | Guardian.co.uk. 18 Sept. 2005. Web. 25 Apr. 2011. <http://www.guardian.co.uk/music/2005/sep/18/brazil.popandrock>. Natal, Bruno. "The Funk Phenomenon | XLR8R." XLR8R | Accelerating Music and Culture. 01 May 2005. Web. 22 Apr. 2011. <http://www.xlr8r.com/features/2005/05/funk-phenomenon>.